Information about sandhill cranes at the Open Space Visitors Center. In Albuquerque in the fall we celebrate one of our most beautiful and cherished seasonal visitors, the Sandhill Crane. One of the best places for watching the Sandhill Crane is the Open Space Visitor Center, which is located adjacent to farm fields managed by the Open Space Division as wildlife habitat. The Visitor Center has become a haven for wildlife enthusiasts, as it allows for unique views of Sandhill Cranes and other bird species, with the spectacular backdrops of the Sandia Mountains and the Cottonwood forests of the Rio Grande. The Sandhill Crane could be the world's "oldest bird." In Nebraska, a crane fossil estimated to be about 10 million years old was found to have the identical structure as the modern Sandhill crane. According to Cornell University, the Sandhill Crane begins breeding when it is between two to seven years old. 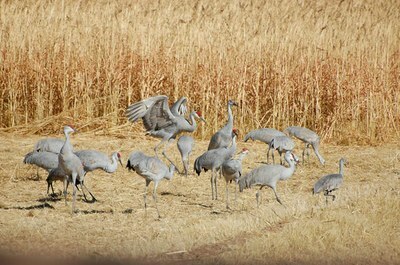 Mated pairs of cranes stay together throughout the year. They migrate south as a family unit with their offspring. The average life span of a Sandhill Crane is 20 years. An adult crane can measure up to four feet tall. Sandhill cranes enjoy a variety of habitat including grasslands, meadows, and wetlands. Their breeding range includes Alaska, Canada, and western Quebec, and into the northern and western United States. Some Sandhill Crane populations can be found as far as Siberia. There are resident populations in southern Florida and Cuba. Sandhill Cranes winter in the United States and northern Mexico. Learn more about the Sandhill Crane from Cornell University.